» How’s That $1 Billion Resort Coming, Real Madrid? How’s That $1 Billion Resort Coming, Real Madrid? You see that hotel right there? 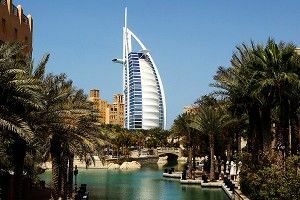 That’s the Burj Al Arab Hotel in Dubai. It’s got seven stars. I didn’t even know you could get seven stars. It’s located on an artificial island, and has a restaurant that sits 660 feet in the air and rooms that cost $27,000 per night. And it’s going to look like a bedbug-riddled flophouse in San Francisco’s Tenderloin in comparison to the resort Real Madrid is building. Provided it can put together the paper. Last week, we told you about the Spanish football club’s plans to build the luxury resort, complete with marina, amusement park, and stadium. Now we have a few more details. Heaps! Hashtag that one #realmadridproblems. Oh, here’s the best part: Guess what the chief executive’s name is? Louis-Armand de Rouge. There must be a real hiring freeze going on in the international jewelry thief industry for a guy with that name to wind up chief executive of Real’s resort. Real hopes to have the 124-acre resort up and running and hosting the rich and famous by January 2015. Oh, and if anyone from Real is reading this, please don’t assume our journalistic standards are too high that I wouldn’t junket the hell out of this place. Ask anyone — I’ve always said visiting Ras al-Khaimah is on my bucket list.